Rio Tinto’s world-class Amrun bauxite project, located south of the Embley River, between Weipa and Aurukun, has created 470 jobs in far north Queensland. The project involved the construction of a processing facility including a beneficiation plant and associated water, electrical and lighting systems. The facility was delivered by West Australian supplier Civmec, which carried out all fabrication, pre-cast manufacture and assembly work at its Henderson facility in Perth using 95% Australian steel. Rio Tinto Amrun Project director Marcia Hanrahan said approximately 350 employees including subcontractors have been employed to work on fabrication and another 120 on module assembly. “Fabrication of these components has showcased best practice Australian manufacturing using 4,000 tonnes of Australian steel,” Ms Hanrahan noted. 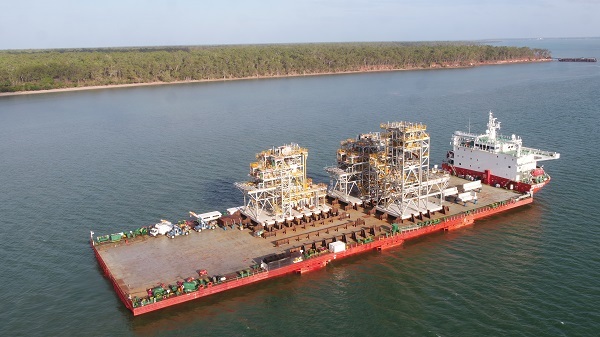 The three beneficiation modules, which were delivered into the Port of Weipa last month, will form the central facility of the plant where bauxite from the Amrun mine will be washed and screened onsite before being shipped to customers. According to the giant miner, the remaining three modules are currently being fabricated in Perth and will arrive later this month. The project is on schedule for completion in early 2019.